Provide an inviting spot to sit with the Central Park Bench. 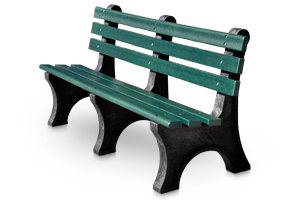 This classical design is made with six 2" x 4" Resinwood	slats and black recycled plastic bases. The weather resistant recycled plastic slats with UV protectant are available in the Resinwood color options of as shown below.